I know. I said normal service would resume, and then I disappeared. The truth is, life has been very busy, and I have a lot less time with R than I’d like. We’ve moved house and been unpacking and getting to know our new village. However, we’ve also been doing quite a lot of fun stuff, when we’ve had time, and I thought I’d tell you about some of it. I’m a playwright and love the theatre, so I have been desperate to introduce R to as much theatre as possible. 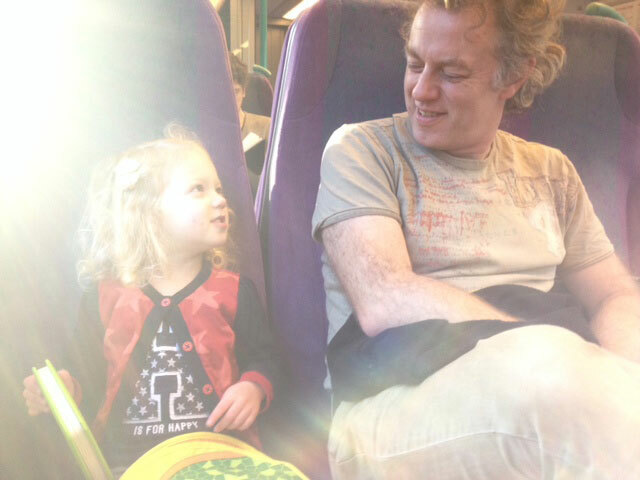 Our first trip, when she was 2, was to see ‘Too Many Penguins’ at the gorgeous Polka in Wimbledon, and was a total disaster – while the other tiny kids sat on the floor enraptured by the action, R screamed so loudly that I had to carry her out, and my ears rang for days. However, since then we’ve seen quite a few shows in various places, and she’s enjoyed every one of them, particularly after the amazing immersive experience of The Sky Is Falling by Scottish Youth Theatre in Glasgow. And as we both now love theatre, I thought I’d include the odd theatre review on this blog from time to time. Last month we took a trip to Greenwich Theatre to see The Cat In The Hat. R is a Dr Seuss fanatic – we have to read at least one Dr Seuss story every bedtime. This has given me the possibly useful ability to recite The Sneetches and Green Eggs and Ham off by heart, among other tongue-twisting Seussian tales. Right from her very first sighting of the set, which was rendered in a cartoon-like style faithful to the original illustrations, R was enraptured. From the mournful fish, showering the audience with bubbles in a mesmerising sequence, to the fine balancing of the stately cat – “look at me, look at me, look at me now”, she was completely captivated. The hyper-frantic Thing One and Thing Two were suitably destructive and the slapstick merriment provoked hysterical laughter from a theatre full of equally entranced small children. At 40 minutes it was an excellent length for toddler attention spans, and we spilled out into the sunshine in a bouncy and boisterous mood. The show had a short run, but should it make a reappearance, we can’t recommend it enough. I tried a game with R last week, and it was a big hit. I wrote out numbers one to 10 on bits of paper and then folded them all up. “What you doing?” she kept asking. I said it was a hiding game and that she had to close her eyes and count to 10, which she did. While she was going that I hid the bits of paper around the living room and the kitchen. I put most of them in fairly obvious places – on top of her beanbag, on her toybox etc, and a couple in slightly harder places – under a cushion, on top of a table that’s a bit above her head height. 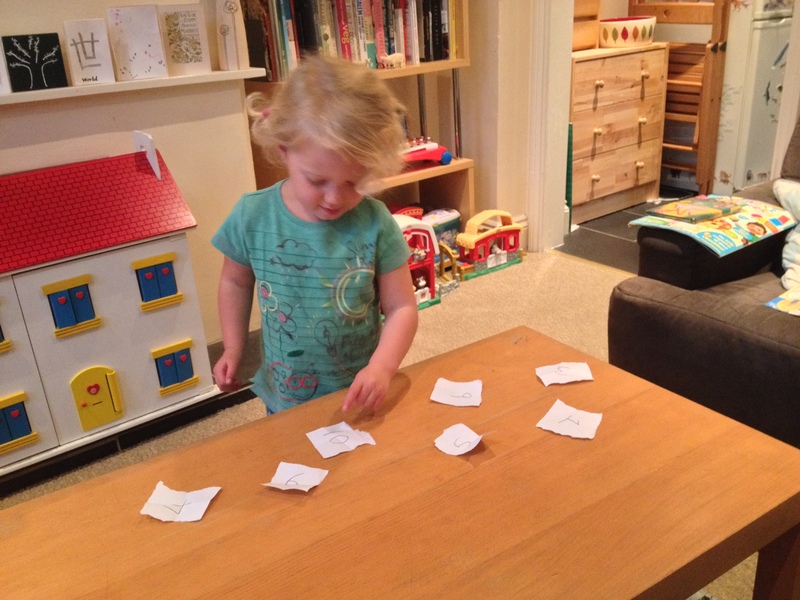 Once she’d finished counting I told her she had to find all the bits of paper and bring them to the coffee table. She needed a little encouragement at first to understand what she had to do, but she picked it up quickly and then was very excited to try and find them. 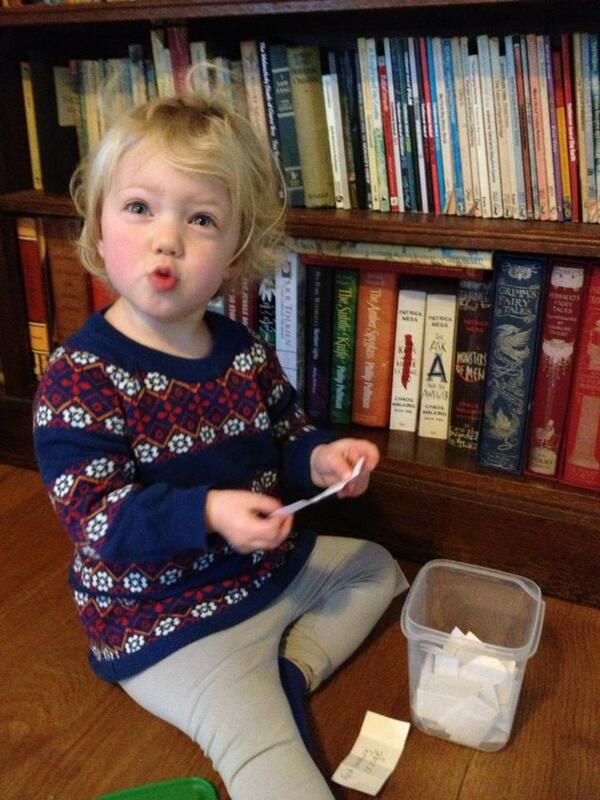 Once she’d found all the numbers, I then asked her to put them in the right order. This was a bit tough at first, but again she picked it up pretty quickly with a little help and was very pleased with herself! We played this three times in a row before she got tired of it, and it was very quick and easy to set up and get going with. A good standby for a rainy day, I think. So, loyal readers, for there are at least, ooh, three of you; it’s all been quiet on here for a while. Our circumstances changed rather suddenly – I went from working at home, four days a week (I did full time hours compressed into those days) to working in an office, in a new job that required us to move from Cambridgeshire to Essex. Since then, it’s been a time of hard work and adjustments and it’s only now that some semblance of order seems to have been restored. Although my new job is brilliant, it has meant some changes that are, frankly, heartbreaking. I miss R terribly when I’m not around, and I particularly miss our one day a week that was just ours. Of course, we have the weekends, but half of our weekends we have Tim’s kids here too, and while that’s fun and great for R, it does mean our one-to-one time is very limited. We’ve found that the town we’ve moved to has some brilliant groups and activities for children, though, and Tim and R go to something exciting almost every day. R is thriving and lovely and sweet and funny and crazy. So it’s all good, really. However, our crafts and games are also now pretty limited. I get home an hour before her bedtime and quite often we just sit and watch TV, or play with the dolls house, or read a book. Occasionally we potter round to the park that’s just around the corner. And I miss our making time. So here is my vow: I am going to make something with R once a week, or play a new game, or just do something new and fun with her. Because this is a new and challenging time in our lives, and I don’t want to lose sight of what I want our relationship to be like. Even though I’ve got to work out of the home, even though our time together during the week is short, I want to be able to make the most of it. I’m hoping you’ll come along with me, and we can all have a good time together. 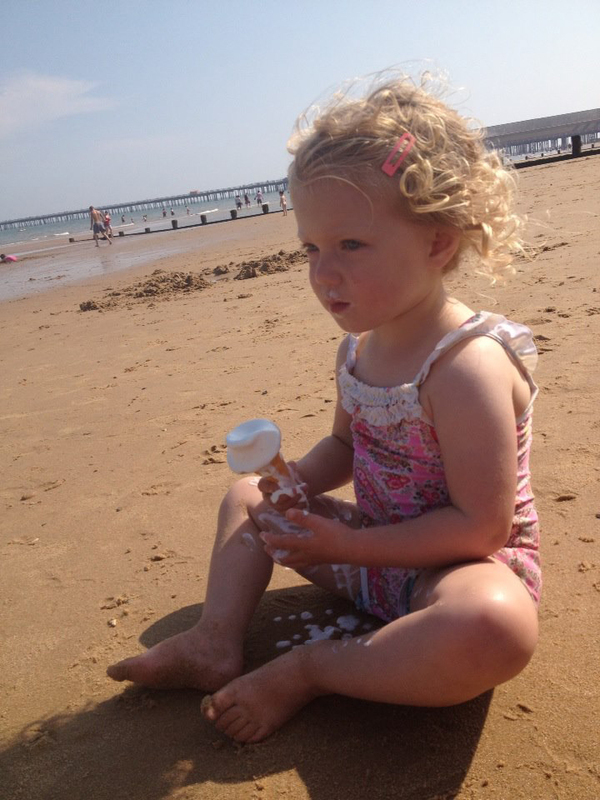 And in the meantime, here’s a picture of R on our lovely local Essex beach. When we got home R went for a sleep and I quickly made some fairy cakes. When she woke up she came downstairs and we decorated them. I’d picked up some little sweets in the baking aisle, like Smarties but smaller, and made with all natural colourings. We made some yellow icing – R had chosen the colour at the shop – and spread it carefully on the cakes…oh, alright, we dolloped it on and watched it run onto the counter. Then we made patterns with the sweets on the icing. After that R helped me stir some mayonnaise into a tin of tuna for sandwiches, and I cut up some cucumber and apple. R then trotted through with a bag of those organic snacks that look just like onion rings or Wotsits, so that even though you’re trying to be all middle class and healthy and stuff you just look like you’re shoving the unhealthiest crisps in the world at your toddler. We put them in a bowl too. I figured Tigger might like them. Then we set about making the invitations for our tea party. I supplied envelopes, paper and pens, and R wrote them out and decorated them. I’m not sure they followed Debrett’s rules, but she seemed quite happy with them and I didn’t hear any complaints from Hello Kitty or Bunny. We brought all the small chairs – two little wooden ones and a mini-Ikea Poang chair that R reads in – and put them round the table, then put a nice white tablecloth on the table (a hostage to fortune, obviously, but I just chucked it in the washing machine straight afterwards) and R helped me carry all the tea things through. 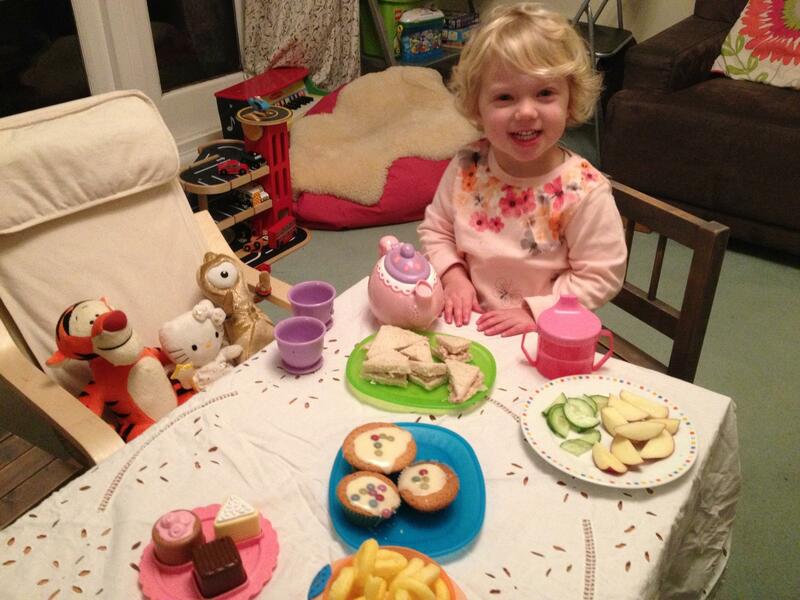 Then we got our singing teapot out – what’s a tea party without a singing teapot? – and we were ready to begin. R poured tea for everyone and we all had some cake and sandwiches and a merry old time was had at our very first tea party. She’s talked about it lots since and in fact, we’re going to have another one today. The cats are invited to this one. I’m sure they’ll be delighted. Although I love baking cakes with R, we haven’t done much in the way of making savoury things, apart from the pizza, so I’ve been trying to think of things we can make together for lunch. 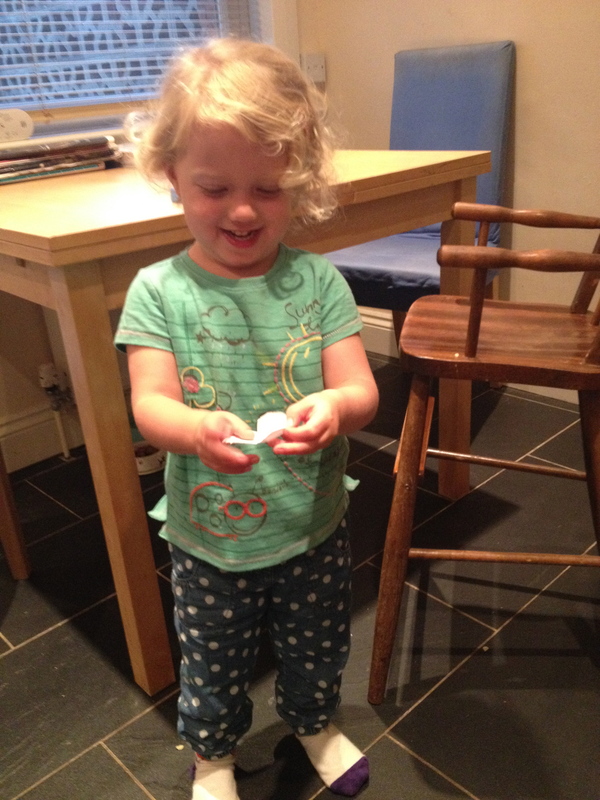 After all, if she’s going to be making us roast dinners by the time she’s six, we have to start somewhere. So I thought it would be a good idea if we tried to make some bread. Unfortunately, even though I’m not bad at all at baking, my bread invariably turns out like a wheaten brick. To try and get over this, I’m going to attempt to make bread with R every few weeks, trying different methods, but to start us off, I decided to cheat a bit and buy a bread mix. I went to the supermarket and bought us a packet of cheese and herb soda bread mix. I’m not going to tell you how we made it – if you buy a packet of bread mix of your own, it will tell you what to do! It turned out to be a really good quick activity to do together. I made the mix and let it prove before getting R involved, and then when it was time to knead it we did it together. 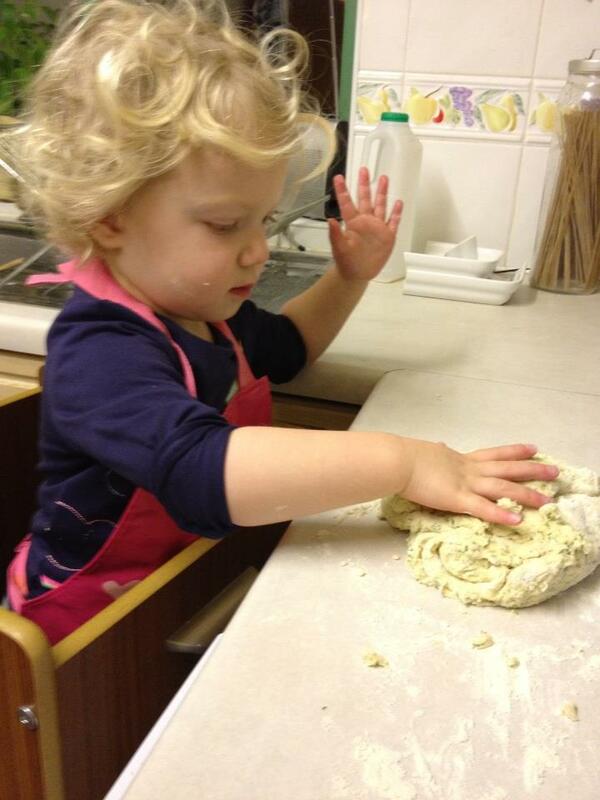 She can be quite fussy about ‘wet’ things sometimes and I’m trying to get her to experiment with touching different textures; true to form she was a bit wary of it at first, but after a little while she got rather into it, pushing her fingers into the dough and rolling little bits between her fingers. Last weekend it was the Chinese New Year. I realise you probably won’t be looking for craft ideas to do with that now (seeing as it’s over) but we had a lot of fun and most of the fun really came from finding something we could theme activities around. I knew I wanted to make a lantern but wasn’t sure how we could decorate it to fit with the theme, so I typed ‘Chinese new year’ into Google and found lots of interesting information. On the BBC Schools – Festivals and Events website I found out that “red symbolises fire which will scare away evil spirits, so people dress head to foot in new red clothing”. If I’d been a bit more organised I would have dressed R in red that morning, but never mind. I got all the red pens, crayons and pencils out and R got scribbling on a piece of white A4 paper. When she had had enough of that, I folded it in half, and cut vertical lines from the folded side, about 1.5 cm apart, stopping about 3 cm from the edge of the paper. I then unfolded it and taped the edges together. R seemed pretty happy with her lantern (though she refused to have her picture taken with it, perhaps she thought I’d done a shoddy job of the cutting and didn’t want it attributed to her). While we were doing that, we listened to some Chinese music. I’ve got a music degree, but I’m ashamed to say I don’t know all that much about non-Western music. I searched on Spotify for ‘Chinese New Year’ and it threw up a few interesting pieces. As it’s the beginning of the Year of the Snake, we also tried to draw some snakes – I drew some wiggly lines and got R to copy them. She liked this and shouted ‘wiggle wiggle’ at the same time, so I can highly recommend wiggly snakes. 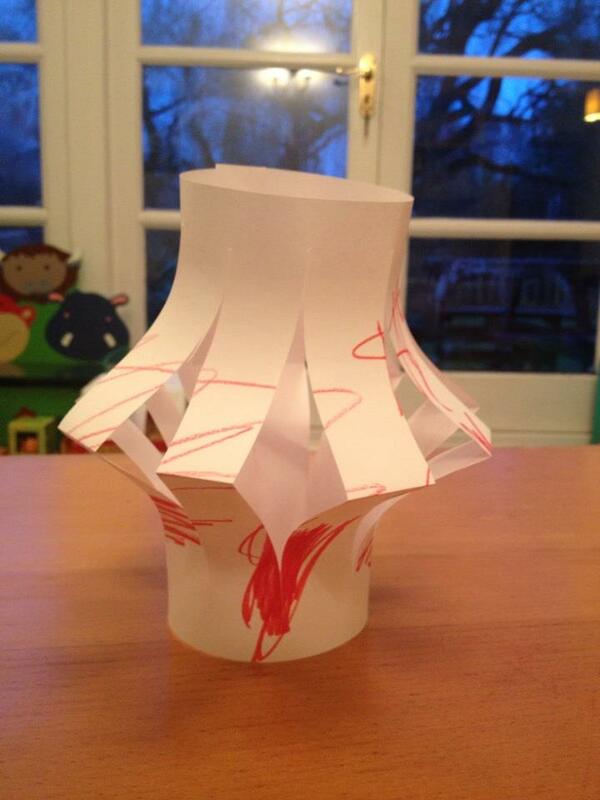 After we’d made our lantern we watched some dragon dances on YouTube – that was really fun – and also watched some fireworks from around the world. I then stepped into the realm of über-pretentious mummy, and we watched a video teaching us how to say ‘hello’, and some other basic phrases, in Mandarin Chinese. Again, I rather wished I’d been a bit more organised as it would have been great to have some Chinese food for R to try too. It was fun to do this though, and I think we will try and do it for major festivals from different cultures – I’m not sure what to look at next, so if anyone has any ideas do let me know. I’d like us both to learn more about other cultures, and doing activities around a theme has a lot of mileage in it too, I think. The last time I was at Hobbycraft I picked up what they called fuzzy sticks and what I call pipe cleaners. I don’t suppose many pipe smokers go to Hobbycraft for their smoking peripherals, though. Anyway, I wasn’t sure what we were going to do with them but as yet another cold, wet day rolled around I remembered I’d bought them and searched about for a bit of inspiration. 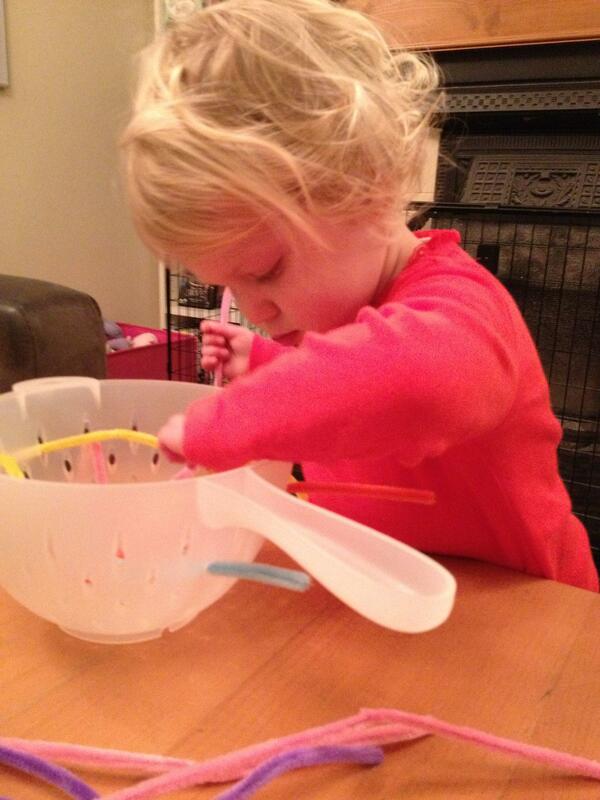 Yet again, the fabulous The Imagination Tree came up trumps, suggesting we poke them through a colander. It doesn’t sound all that exciting, but it kept R occupied for ages, and took lots of concentration. Sometimes she got a little frustrated but aside from a bit of help every now and again she did well at sorting out the problems on her own. She also enjoyed naming the colours and feeling the fuzzy texture. 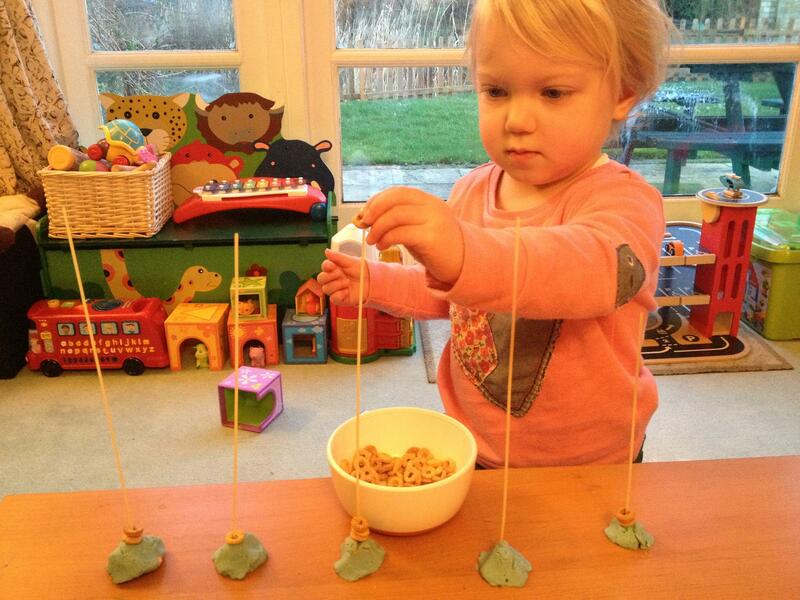 You do need to keep a careful eye on this activity as they are obviously made of wire, and the ends are quite sharp. This is quick, clean and easy to set up. It’s useful to know that if any of us take up smoking a pipe, we will have the necessary accoutrements to hand. R and I haven’t done much in the way of science. Because, well, you know, she’s two. We have tried a few fun little ‘experiments’ though, and I can see us doing more quite soon as she’s getting more and more interested in the world around her and how it works. A little while ago we tried making kitchen fireworks. Which is not as scary as it sounds. 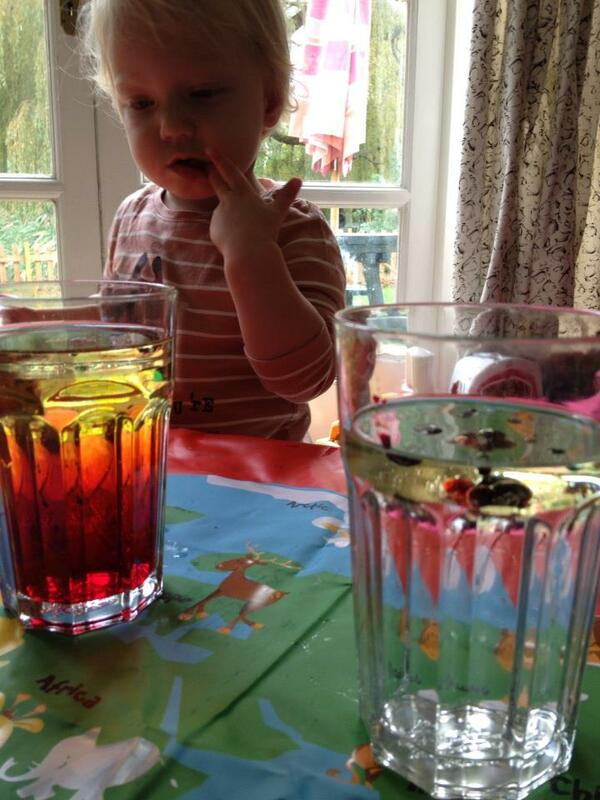 We got some glasses, some water, some oil – vegetable oil was recommended but we used sunflower oil – and some food colouring. You pour room temperature water into the glass, leaving about an inch of space at the top of the glass. Then add the oil until there’s about an inch of oil on top of the water – then add a few drops of food colouring. What is supposed to happen is that the drops of colour go slowly through the oil and then kind of explode when they get to the water. That didn’t quite happen with ours – it went pretty well with one glass, but in the other, they just kind of swirled around. I think that there wasn’t quite enough oil in it and the water was a little too cold. It didn’t matter much, though, as R seemed fascinated with the colours mixing together and enjoyed sticking a paintbrush in and turning it all to muddy greenish-brown water. The other one was really pretty and we watched the drops for quite a while. I think if I do it again I will make sure the water is truly room temperature (I was a little bit impatient to get experimenting) and I will also use vegetable rather than sunflower oil to see if that makes a difference. It was still a nice activity, even though it didn’t work out perfectly.